Leymah Gbowee, a 2011 Nobel Peace Prize Laureate and EMU alumna, will be the featured speaker at a Feb. 7, fundraising dinner to support families who have lost loved ones or been displaced due to Ebola. After spending the summer thousands of miles from her native Liberia and watching nervously from afar as Ebola swept through her country, sophomore Winifred Gray-Johnson wanted to take action when she returned to the Eastern Mennonite University campus. She never imagined that desire, born from hours of long-distance conversation with her family members and prayer over the sufferings of fellow West Africans, would draw the attention and support of her university community – and a Nobel Peace laureate. That question quickly became “What can we do?” when shared with fellow members of EMU’s International Students Organization (ISO). To Gray-Johnson’s surprise and delight, Liberian peace activist and Nobel laureate Leymah Gbowee (MA in conflict transformation ’07) learned of the fledging movement and enthusiastically agreed to headline a fundraising dinner. Tickets for the Feb. 7 dinner with Gbowee at EMU’s Martin Chapel, with a seating capacity of 140, are $100, with $80 of that a tax-deductible donation to the Gbowee Peace Foundation Africa. Dinner guests will receive preferred seating at a public lecture later in the evening in Lehman Auditorium. A freewill offering will be taken at the lecture, with an online donation option for those who cannot attend. “She is helping us raise awareness, but at the same time, we know that this money will go through her organization to those who most need it, [to] the children who have lost family members or been displaced,” Gray-Johnson said. Gbowee, who received the 2011 prize for her work in ending Liberia’s civil war, says that her country’s decade-long peace is threatened by Ebola. Since the Ebola outbreak began, Gbowee’s Monrovia-based non-profit Gbowee Peace Foundation Africa has contributed to community-based, grassroots education, outreach and awareness. Donations from the EMU fundraiser will be shared by the foundation with two Liberian organizations founded by alumnae of EMU’s Women’s Peacebuilding Leadership Program: GSA Rock Hill Community Women in Monrovia, founded by Vaiba Flomo (CJP Grad. Cert. 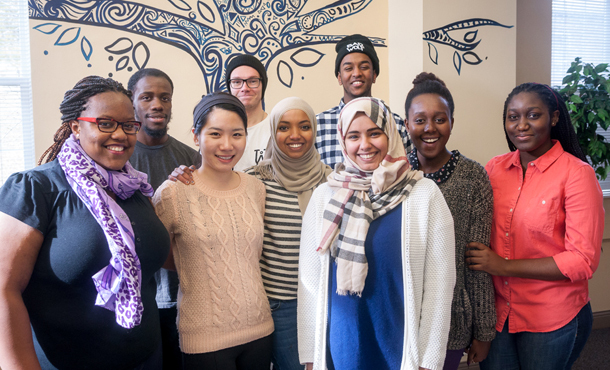 ’13), and Messengers of Peace, a youth outreach group founded by Gwendolyn Myers (CJP Grad. Cert. ’14). 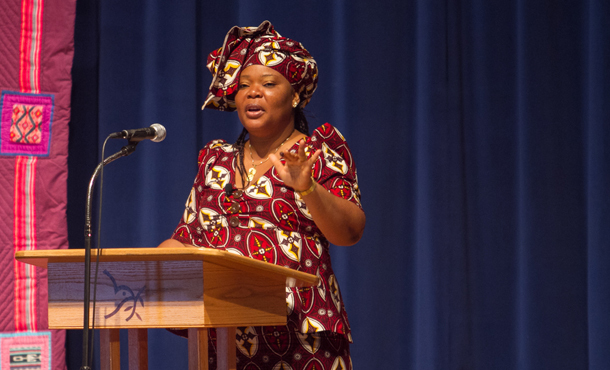 Gbowee’s visit kicks off a series of events planned by the International Students Organization in March, including a color run, chapel talk, and movie showing. Kaltuma Noorow, ISO co-president, said students have rallied to the cause, inspired first by Gray-Johnson’s willingness to share how she and her family were personally affected by the outbreak. At later ISO planning meetings, student organizers discussed “the stigma of disease and who was getting aid and who wasn’t, which led to conversations about who needed help who wasn’t getting it. We’ve all seen that in our own countries,” said Noorow, a junior peacebuilding and development major from Kenya. From following appropriate fundraising protocols to parsing out the correct wording for public relations releases and invitations, Gray-Johnson says the hands-on experience has taught her about the complex realities of fundraising for international causes. Noorow and Gray-Johnson both met Gbowee briefly when she came to campus in spring 2014 to deliver the commencement speech and celebrate the graduation of her son, Joshua Mensah, a digital media major. They are looking forward to learning more about Gbowee’s peacebuilding experiences from the woman herself. 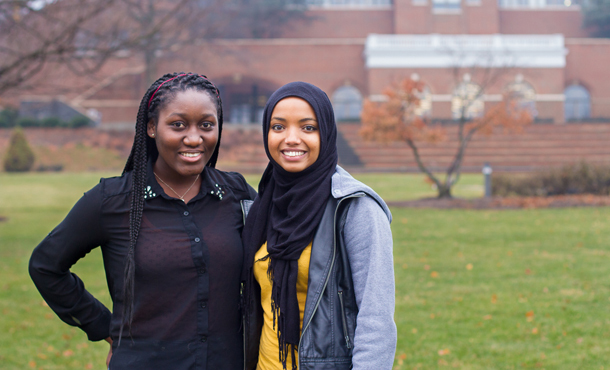 Gray-Johnson hopes to share the experience with her 14-year-old sister, Addy, who moved from Liberia this summer to Maryland, where she’s living with an aunt.